Product Description: For those who need added security and retention for use with hearing aids, cochlear implant processors or eyeglasses.SafeNSound Clipz™ are for you!! The adjustment bead fits snug against the head, clips right to the clothing for added security! Perfect for infants, toddlers, the physically or mentally challenged, the elderly or anyone who is active and needs some added security for their assistive device. Nursing Home and Hospital staff love this product! 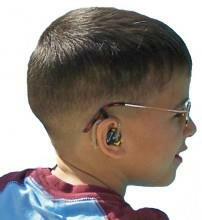 The SafeNSound Clipz™ are available in a variety of colors including black, brown, navy, pink, red, and royal blue. Can be worn with any or all simultaneously without any modification: eye-glasses, BTE cochlear implant processors or hearing aids. All SafeNSound™ products are available with a wide variety of adjustment beads, including, but not limited to: cats, dogs, teddy bears; airplanes, trains, and automobiles; hearts, butterflies, horses. Adjustment beads come in various styles as well, such as opaque, sparkle, even glow in the dark! Sportz Clipz™ also available in baseball, basketball, billiards 8 ball, football, soccer, and volleyball. When ordering, please specify strap color and adjustment bead color and type. Will NOT affect the sound quality or clarity of your hearing device!!! If you need this product for only one BTE product, look for SafeNSound Single Clipz™ If you want to purchase this adjustable product without attaching to clothing, look for our SafeNSound Strapz™ or SafeNSound Barretz™. Product Description: For those who need added security and retention. For use with BTE hearing aids, cochlear implant processors and/or eyeglasses. SafeNSound Single Clipz™ are for you!! The colorful strap attaches to hearing device and clips right to the clothing for added security! 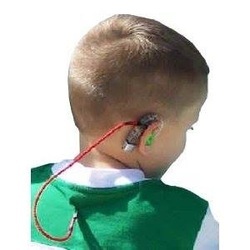 Perfect for infants, toddlers, the physically or mentally challenged, the elderly or anyone who is active and needs some added security for their assistive device. Nursing Home and Hospital staff love this product! This product is not adjustable but is available in Size Infant and Child. 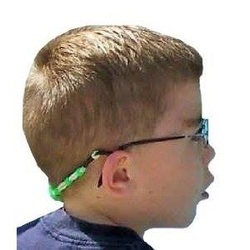 The SafeNSound Single Clipz™ are available in a variety of colors including black, brown, navy, pink, red, and royal blue and can be ordered with name or decorative bead if desired including, but not limited to: cats, dogs, teddy bears; airplanes, trains, and automobiles; hearts, butterflies, horses. Adjustment beads come in various styles as well, such as opaque, sparkle, even glow in the dark! Also available in baseball, basketball, billiards 8 ball, football, soccer, and volleyball. When ordering, please specify strap color and adjustment bead color and type (if desired). Will NOT affect the sound quality or clarity of your hearing device!!! 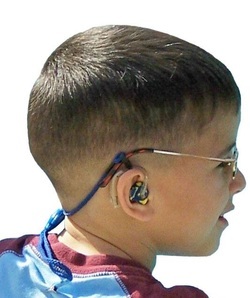 If you need this product for a bilateral BTE hearing device, look for SafeNSound Clipz™. If you want to purchase an adjustable product without attaching to clothing, look for our SafeNSound Strapz™ or SafeNSound Barretz™. Note: Sizing Information: The SafeNSound Strapz™ are the only one that requires a size. All of the clips are one size fits all. However, you can order a clip in size infant with a smaller adjustment bead for little heads, which will be 2" shorter in length. For proper fit measure from top of left hearing aid or Cochlear Implant BTE Processor, loosely around base of head to top of right device. If you are in between sizes, choose the smaller one, or better yet, ask for a custom fit in the special instructions section of our order form. The size you order will be the SMALLEST size; your strap will adjust up to 2" larger, but will NOT adjust smaller! The strap comes in sizes Newborn-6", Infant-7", Toddler-8", Child-9" and Youth-10" and Adult-11". If you have any questions, please feel free to call us. You are our top priority! For eyeglasses/sunglasses: measure from the part of the bow that reaches behind one ear, around the base of the head and up to the same spot on the other bow. For small aids: Unscrew J-hook from aid, slide silicone loop over hook and slide PVC ring to tighten. Replace J-hook and repeat on other aid. For large aids or BTE CI processors: Slide silicone loop over the top or bottom of the aid and slide to the center of the aid to the point that seems to hold the aid in place best. If you find that the adjuster slide prevents you from stretching the fitting loop to fit your aid, simply slide to remove it, which should make the fitting loop stretch to accommodate even the largest aids and cochlear implant processors. For glasses/sunglasses, slide bow of glasses through the adjustable loop and slide to tighten. Product Description: For those who need added security and retention for use with hearing aids, cochlear implant processors and eyeglasses.SafeNSound Duo™ is for you!! Perfect for anyone who needs some added security for their hearing instrument and glasses. If you want to keep your BTE hearing device and glasses connected you'll love this product! The SafeNSound Duo™ is available in a package of 2 or in a value pack of 4. Will NOT affect the sound quality or clarity of your hearing device!!! All other SafeNSound™ products are available with a wide variety of adjustment beads, including, but not limited to: cats, dogs, teddy bears; airplanes, trains, and automobiles; hearts, butterflies, horses. Adjustment beads come in various styles as well, such as opaque, sparkle, even glow in the dark! Sportz Clipz™ also available in baseball, basketball, billiards 8 ball, football, soccer, and volleyball. 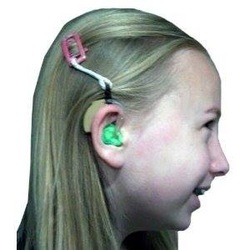 If you need a product that is adjustable and attaches to clothing look for the SafeNSound Clipz™, If you need a product for only one BTE hearing device, look for SafeNSound Single Clipz™ If you want to purchase an adjustable product without attaching to clothing, look for our SafeNSound Strapz™ or SafeNSound Barretz™. For small aids: Unscrew J-hook from aid, slide silicone loop over hook and slide PVC ring to tighten. Replace J-hook and repeat on other aid. For eyeglasses/sunglasses: measure from the part of the bow that reaches behind one ear, around the base of the head and up to the same spot on the other bow. For large hearing aids or cochlear implant processors slide silicone loop over the device to the center for best results. If you find that the adjuster slide prevents you from stretching the fitting loop to fit your aid, simply slide to remove it, which should make the fitting loop stretch to accommodate even the largest aids and cochlear implant processors.